If an individual has experienced severe sunburns as a child, the chance of having skin cancer as an adult is greater. The sun gives off two types of UV rays: UV-A rays and UV-B rays. UV-A rays penetrate the skin deeply, affect connective tissue, and cause the skin to sag and wrinkle, and UV-A rays may help cause skin cancer. At any rate, UV-A rays are believed to increase the effects of UV-B rays, which are the primary cancer-causing rays. UV-B is more prevalent at midday. Use a broad-spectrum sunscreen that protects you from both UV-A and UV-B radiation, and has a sun protection factor (SPF) of at least 15. (This means that if you usually burn, for example, after 20 minutes exposure, it will take 15 times longer, or 5 hours, before you will burn.) Children should use a higher SPF such as 30 or 45 (a sun block). Wear protective clothing. Choose fabrics with a tight weave, and wear a wide-brimmed hat. A baseball cap does not protect the rims of the ears, which often burn and then get infected. Wherever the ozone layer is thinner than usual, even more protection is required. In Australia, because of a thin ozone layer due especially to the Earth’s rotation, school children are allowed outside for recess only if they wear a wide-brimmed hat and long sleeves. Wear sunglasses that have been treated to absorb both UV-A and UV-B radiation. Otherwise, darkened sunglasses can expose the eyes to more damage than usual because the pupils dilate in the shade. For this reason, do not let children wear “fun” sunglasses outside in the sun. Purchase children’s sunglasses only if there is a tag indicating UV-ray protection. 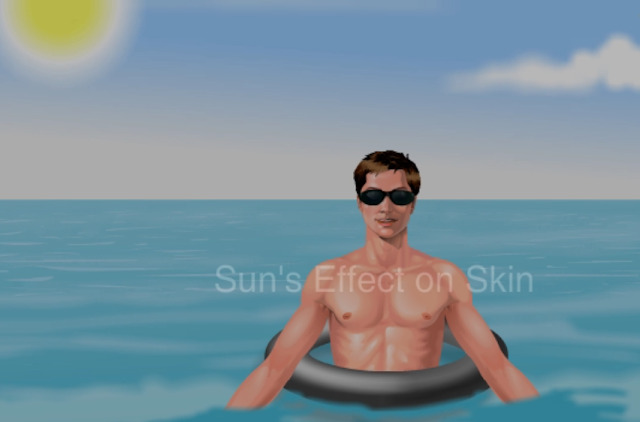 Avoid tanning machines unless prescribed by a physician for Seasonal Affective Disorder (SAD). Although most tanning devices use only high levels of UV-A radiation, the deep layer of the skin become more vulnerable to UV-B radiation upon later exposure to the sun.